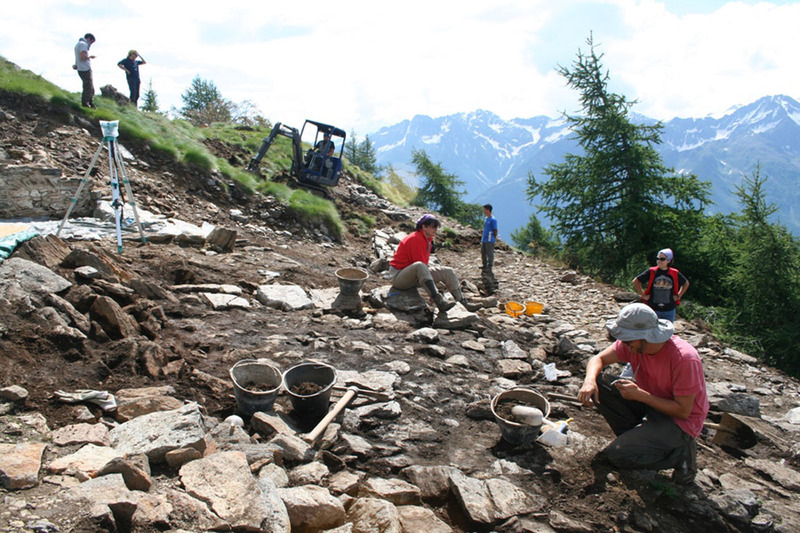 The excavations at Tor dei Pagà have shown that the legends have some basis in truth, even if we need to move away from the written record and let ourselves be guided by archaeology – archaeology touches the history that is “written” into the earth. 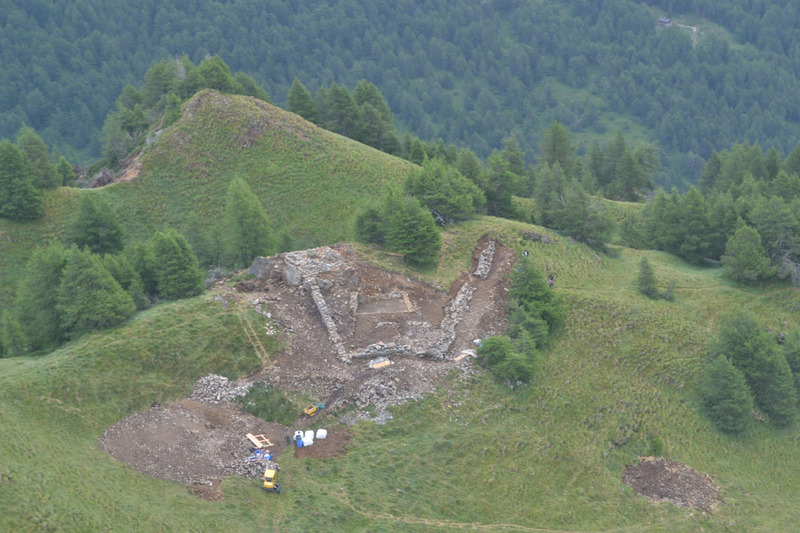 Numerous field seasons of archaeological work have shown that there really was a fortification at Tor dei Pagà. 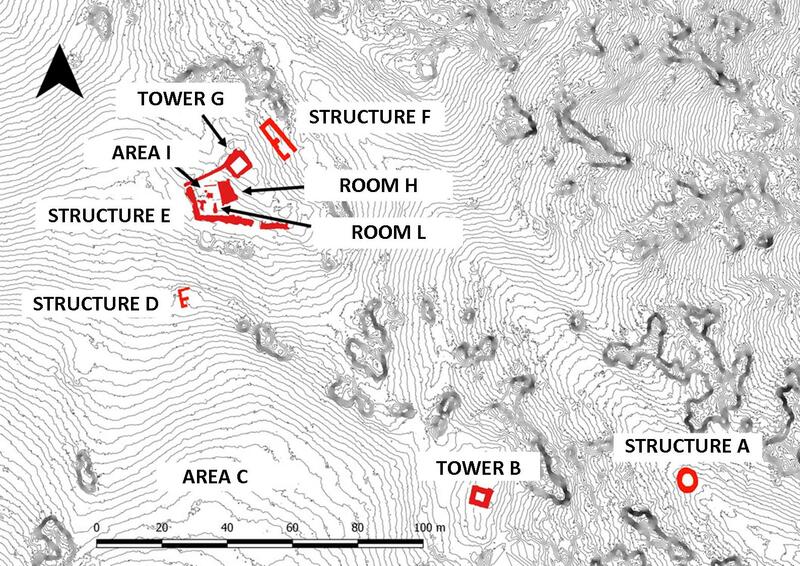 The fortification comprised a complex of structures: there are at least two towers, one of which (G) is located at a corner of a group comprising the polygonal wall (E) and a group of internal structures (H, I, L) while the other, smaller tower (B) is located less than 200 m away along the rocky ridge descending from Mount Bles. 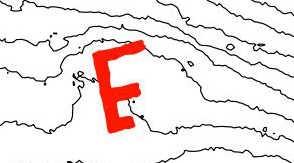 In addition, there is a group of surrounding structures (A, D and F). 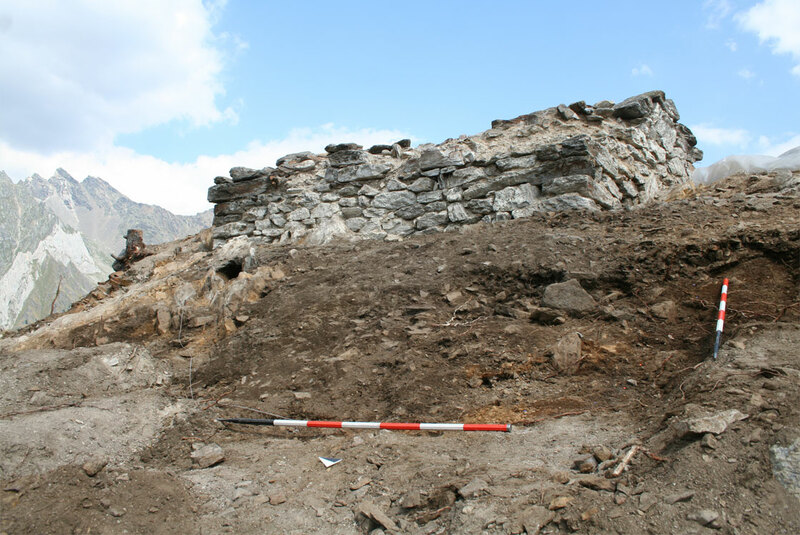 On the basis of stratigraphic evidence and finds (especially coins) we can date the fortification to a single phase of use from the late 13th century AD into the 14th century AD. 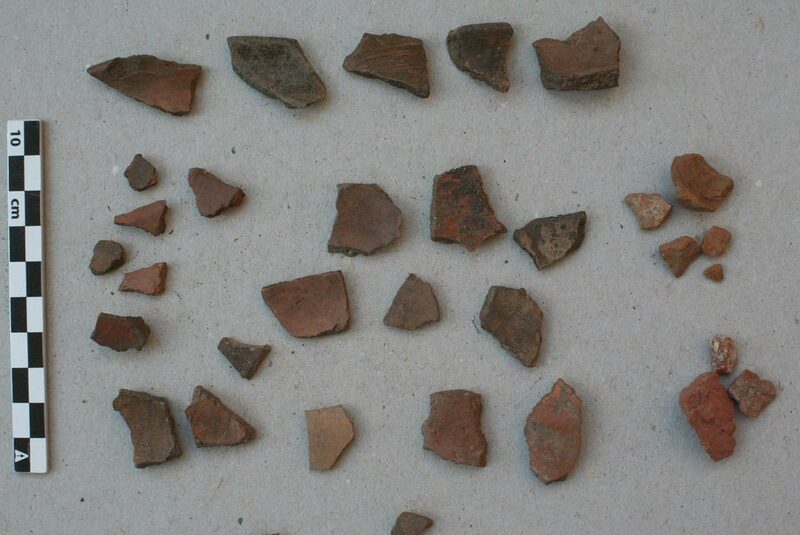 Some of the finds from the excavations can be seen in the Vione Museo Etnografico “’l Zuf”. 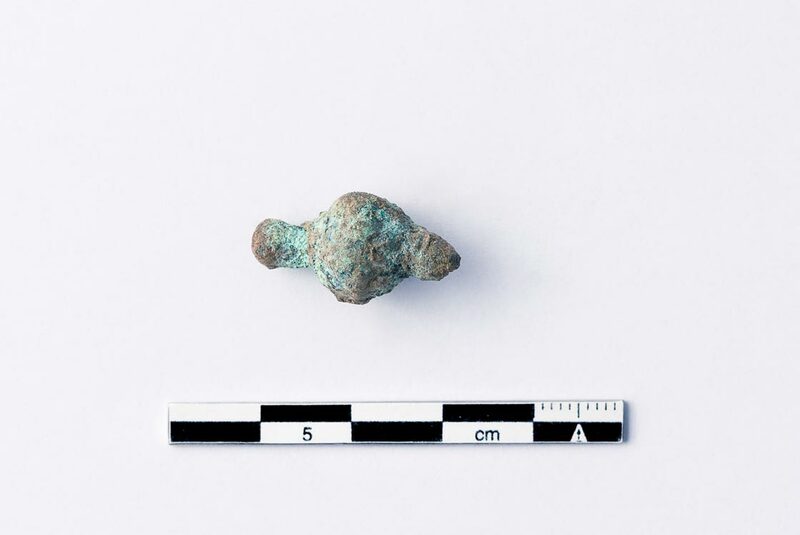 Some of these finds – the points of crossbow bolts and arrowheads – point to the presence in the fort of soldiers, not simple hunters. 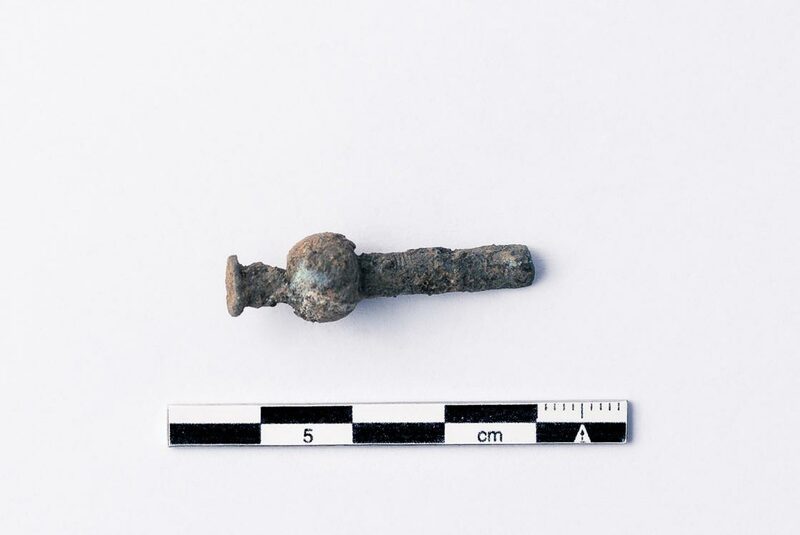 On the other hand, finds of buttons, small floral studs in silver alloy for a belt, bronze belt fasteners and fragments of a glass beaker point to the presence of at least some people of a relatively high social status. 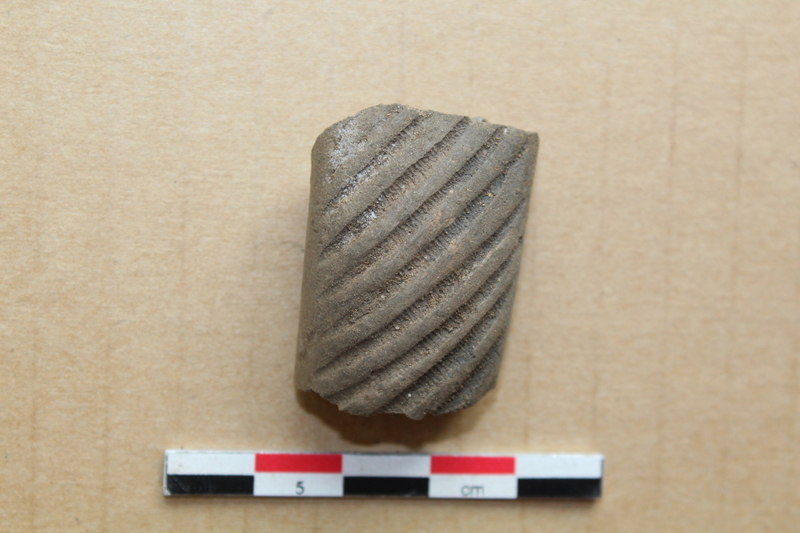 To learn more about the finds made from 2011 to 2104 you can use the link to look at the panels (in PDF format) from the exhibit at the ‘L Zuf museum. 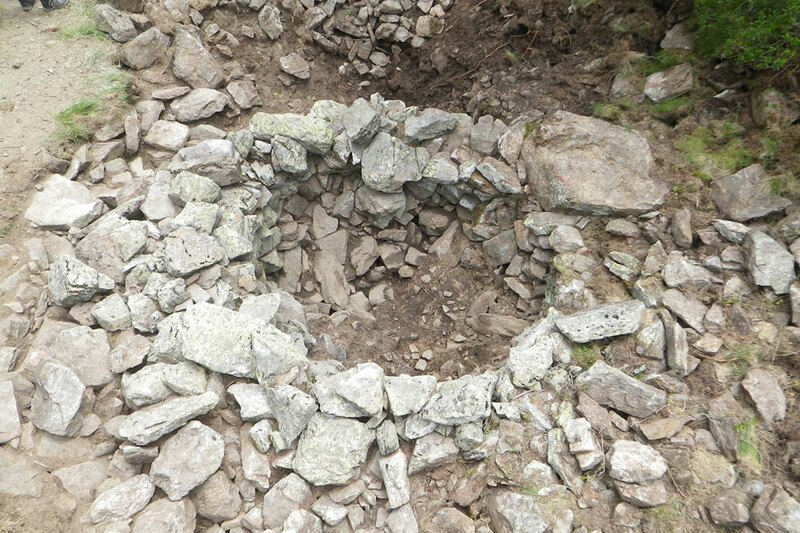 A circular drystone building about 5 m in diameter. 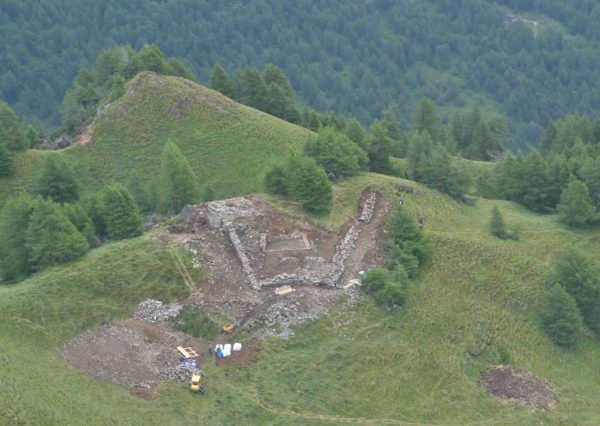 It was noted and mapped by Mirabella Roberti in 1977 and fully excavated in 2017. 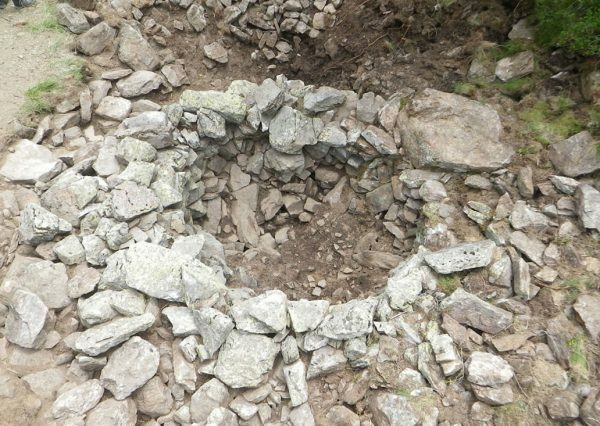 The circular form had led people to think that it was a sheepfold. 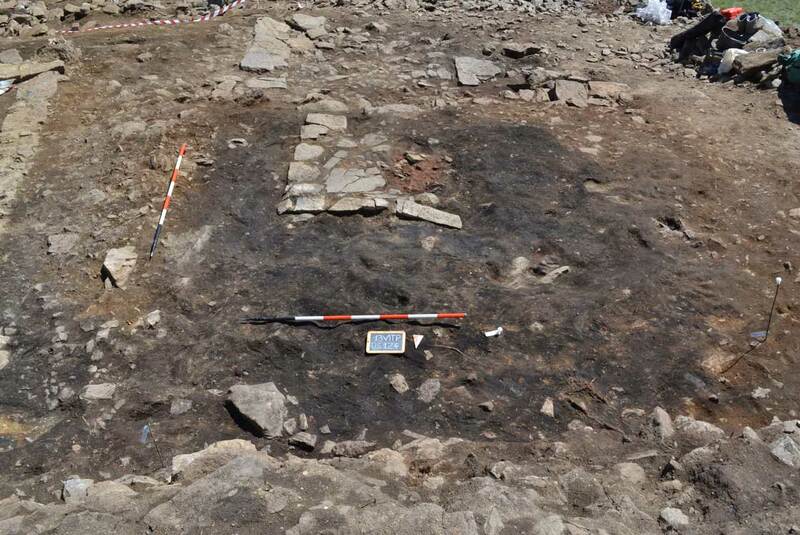 After the recent excavations, the most likely theory is that it is a post-medieval/modern structure built using rubble from Tower B which is located above it. 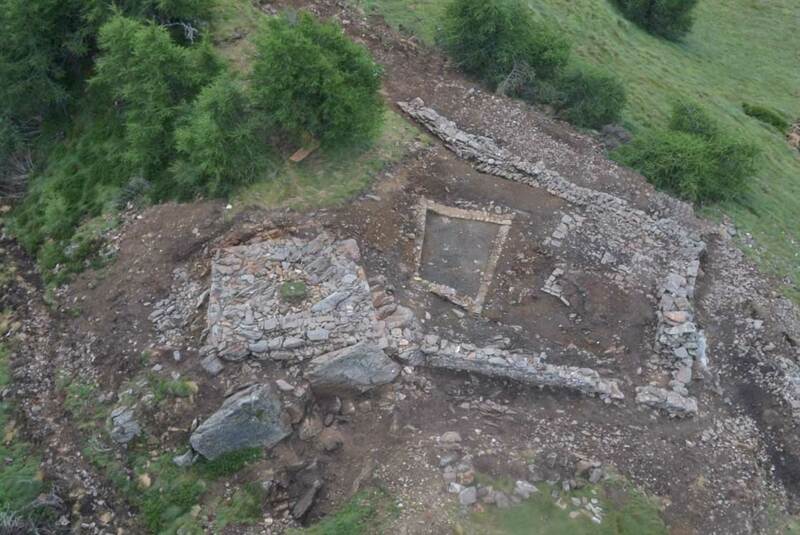 It was perhaps used as a temporary shelter by shepherds in the area after the abandonment of the fortifications. Tower B is built directly on the bedrock. 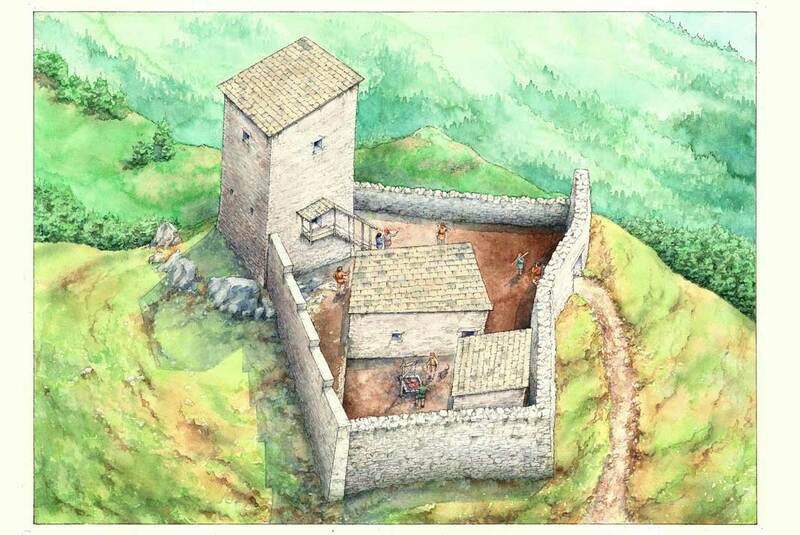 It has a square plan and rubble core walls with rough schistose stones and a white-pink mortar. 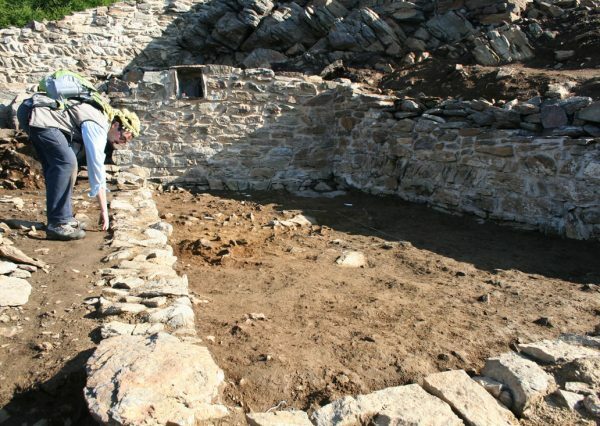 The interior was partly excavated in the 1970s: several photographs from Mirabella Roberti allow us to conclude that excavation inside the tower occurred in July 1977. 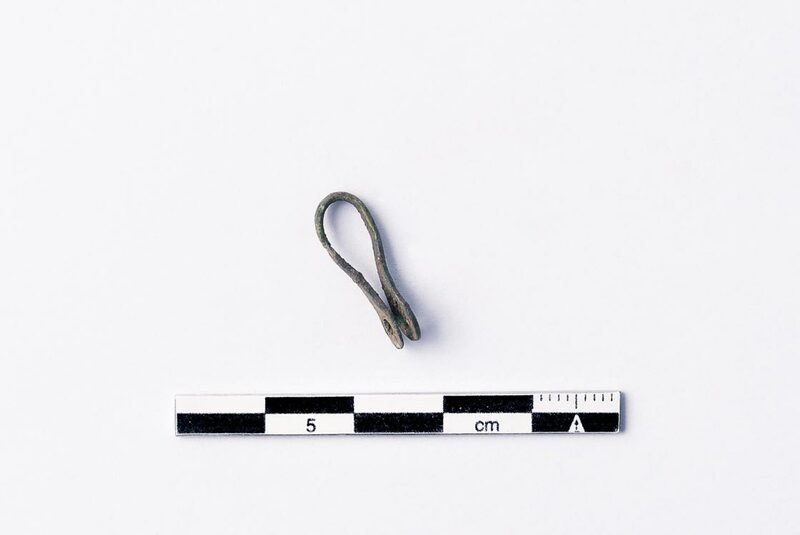 Mirabella Roberti refers to the recovery of a knife blade and a belt buckle during his brief excavation. These have, unfortunately, been lost. 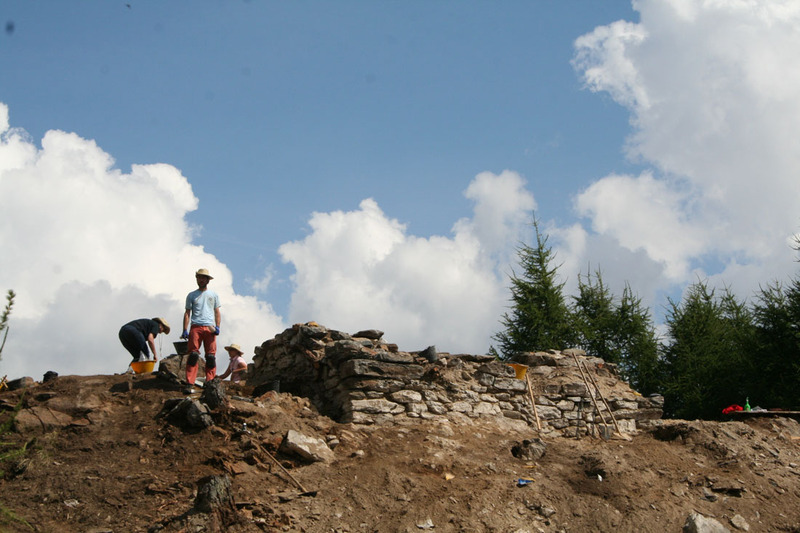 The excavations of the past few years have freed the tower from all the rubble that covered it. 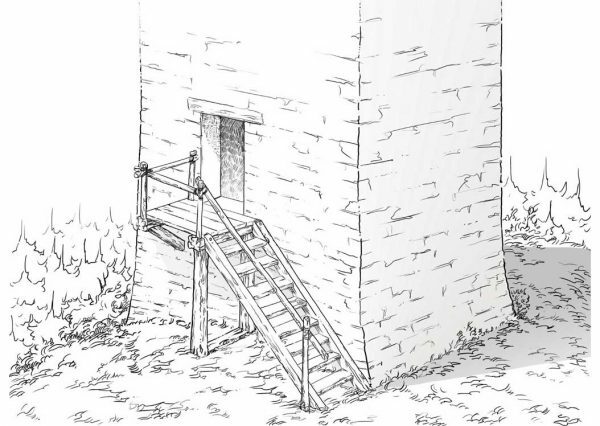 While we have not been able to identify the living floors within the tower we have discovered that the structure was built on top of a protohistoric cult site (see the Protohistoric Phase section). Finds connected with the time that the tower was in use are a D-shaped buckle and a “grosso aquiline” or Adlergroschen – a coin – issued by Mainardo II and Alberto, counts of Gorizia-Tyrol, between 1259 and 1275. 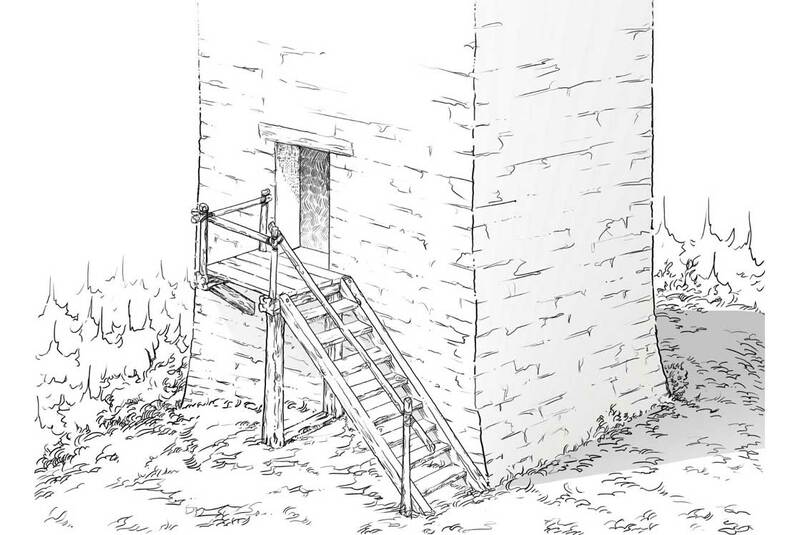 A large wooden beam – perhaps part of the stairway giving access to the tower – was also recovered. The 2017 field season also identified an area associated with the construction of the tower: just to the northeast of the tower there is a zone of compacted mortar. This area, known locally as Sagrà di Pagà, is located at the lower end of the fortified complex. 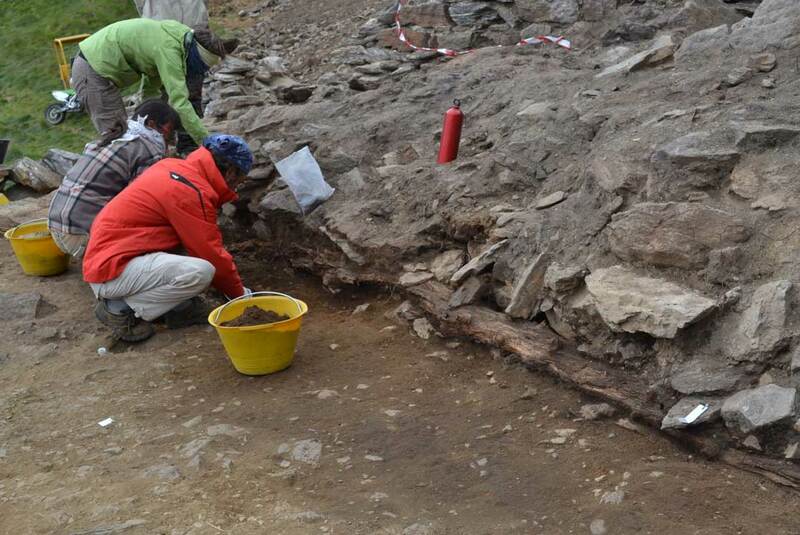 It was partially excavated in 1976 and two small trenches were excavated in 2014 and 2015. 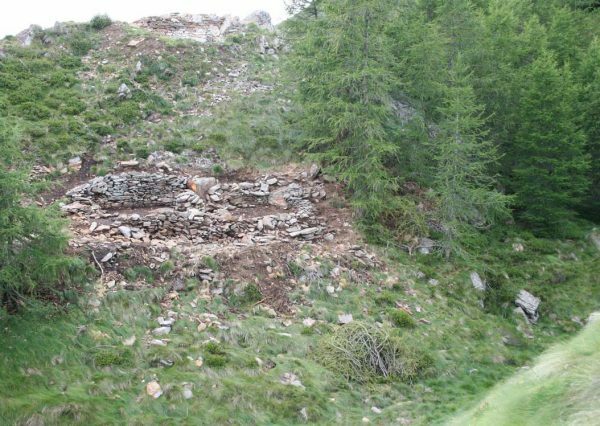 The excavations revealed a small stone structure and an accumulation of stones mixed with earth, probably debris fallen from Tower B above. 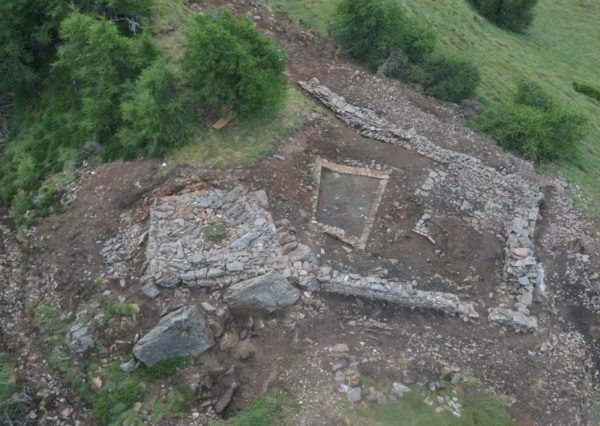 Three objects were recovered – two knife blades and a leather purse – that also most likely originated in Tower B above and fell down the slope. A small quadrangular building with relatively crude drystone walls. It is located part way down the slope to the south of Structure E and was given its name in 1977. 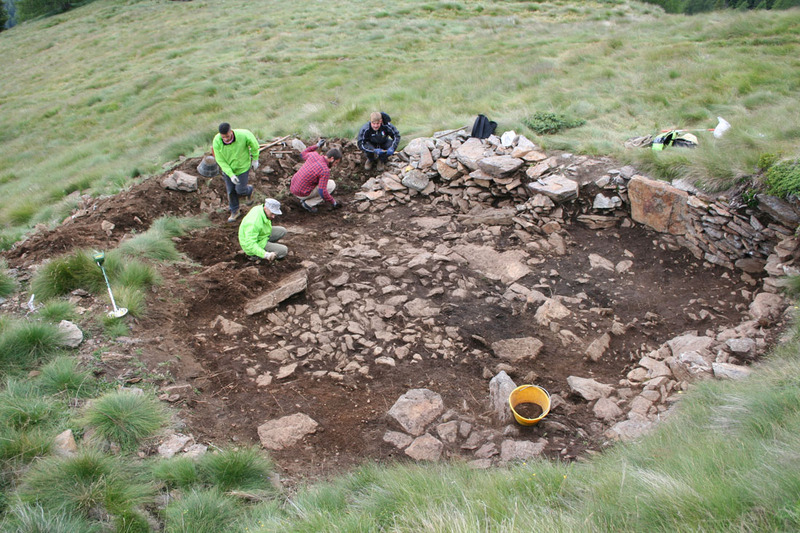 The structure was excavated in 2016 but no finds were made which makes dating difficult. 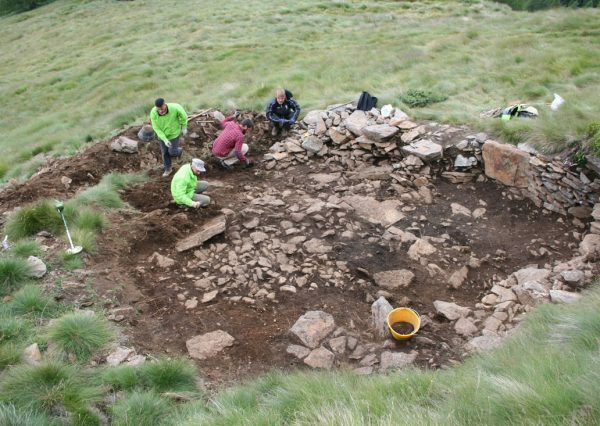 The structure is perhaps a post-medieval/modern building – used by the shepherds who exploit the summer pastures – that was built using rubble fallen from Structure E.
Structure E, at the highest point of the site, is the largest and in some ways most complex. It contains Tower G, Rooms H and L and Area I. These zones fall within a boundary wall made up of different sections. The northern segment of the wall is made of irregular schistose stones of diverse dimensions, laid in a relatively regular way and mortared. 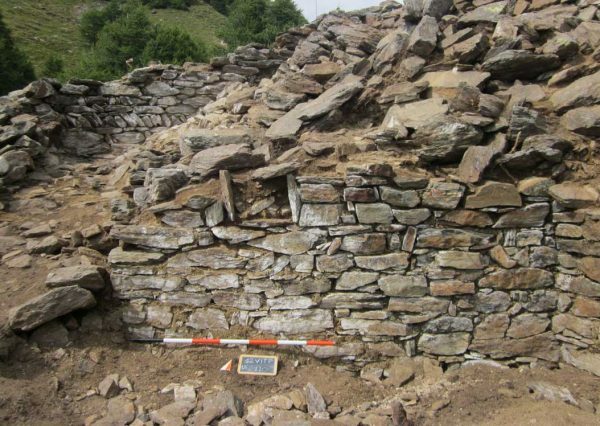 The western section is also built of schistose stones but they are larger and more irregular compared to those of the north wall and they are laid without mortar. The southern part of the boundary wall is built similarly to the western segment. 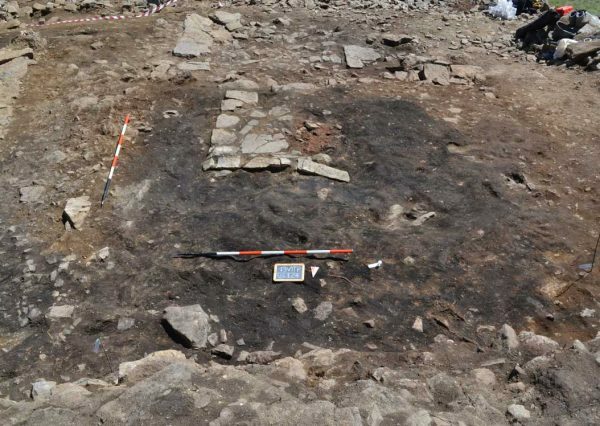 In the southern part we can see a gap that has been interpreted as the gateway to the interior of Structure E. The building was occupied, on the basis if finds from the excavations, in the period between the late 13th century and the 14th century. 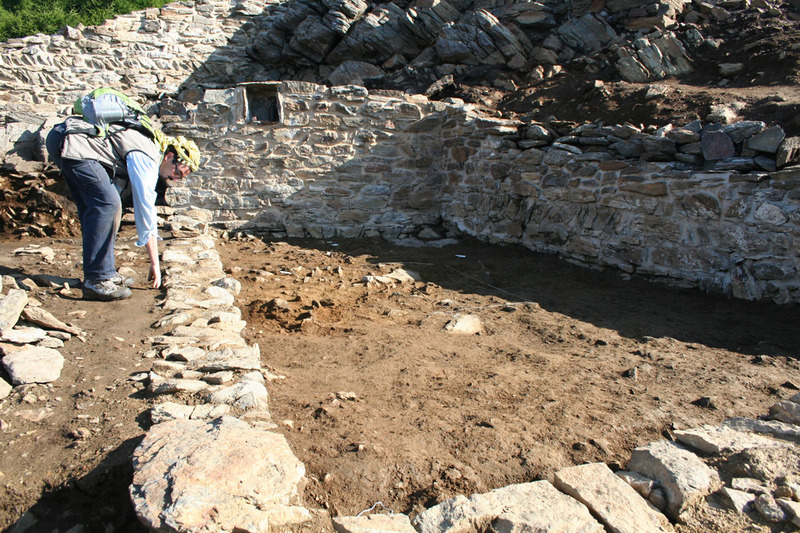 A rectangular building divided into two similar sized rooms and constructed of simple drystone walls. 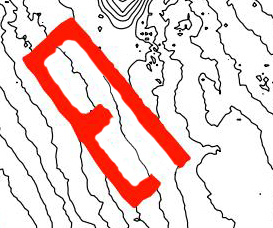 It is located halfway down the eastern slope from Structure E and was named Structure F in 1977. 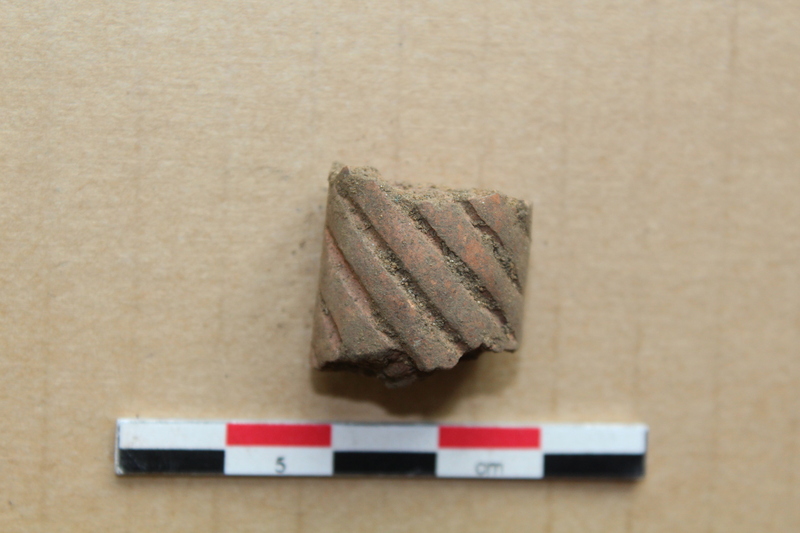 The structure was excavated in 2016 and produced a modern key in one of the interior use floors. 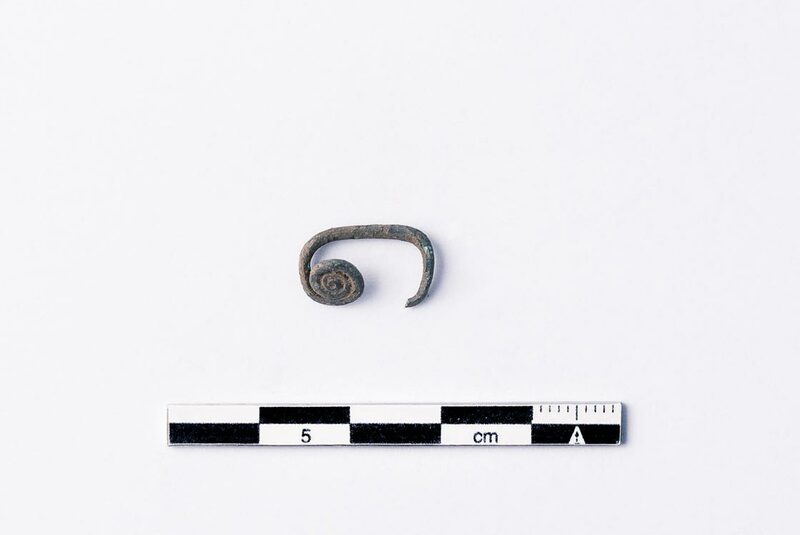 The excavation also produced many carpentry nails with L-shaped heads, blacksmith’s nails and a D-shaped buckle – all out of context and similar to finds from Structure E. These finds support the idea that Structure F was built with stones that had slid down the slope from the collapsed Structure E.
This structure was not identified during the 1970s excavations and constitutes the first discovery of these more recent excavations. The tower is located at the highest point of Structure E, on the rocky outcrop descending from Mount Bles. 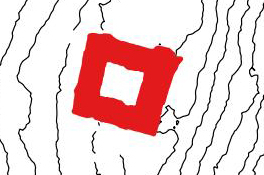 It has a square plan and was built of relatively large shaped blocks of schistose rock laid directly on the bedrock. 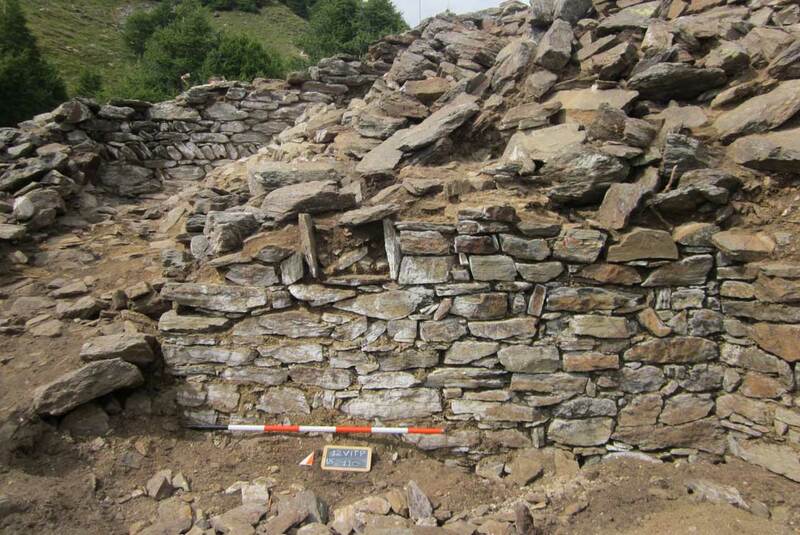 The walls are mortared and built according to the rubble core method. 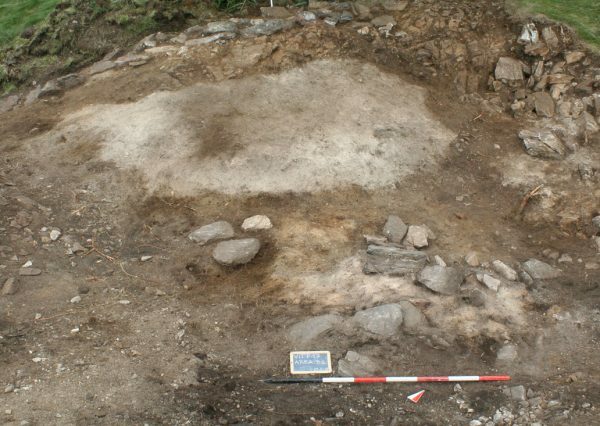 The base is completely covered by a level of small schistose stones (without any binder) and the natural rock – this would have formed the foundation for the internal floor, of which no trace remains. 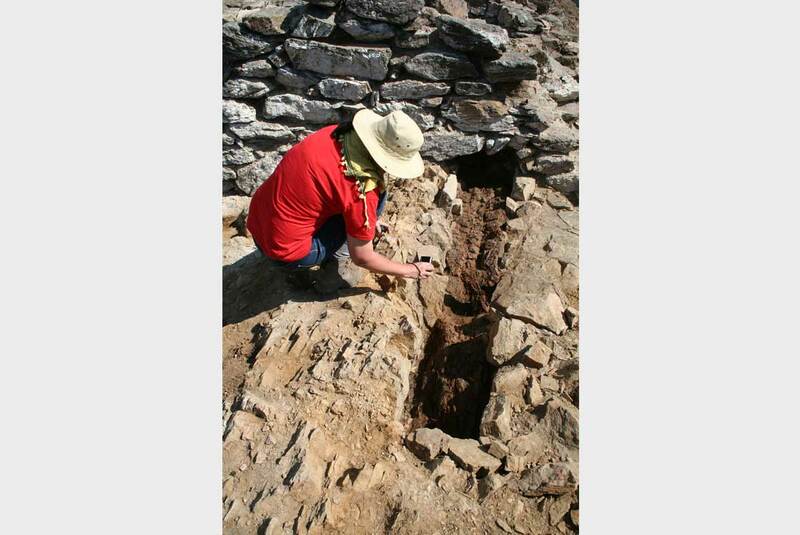 This is one of the rooms found within Structure E. It has a trapezoidal plan with a beaten earth living floor. 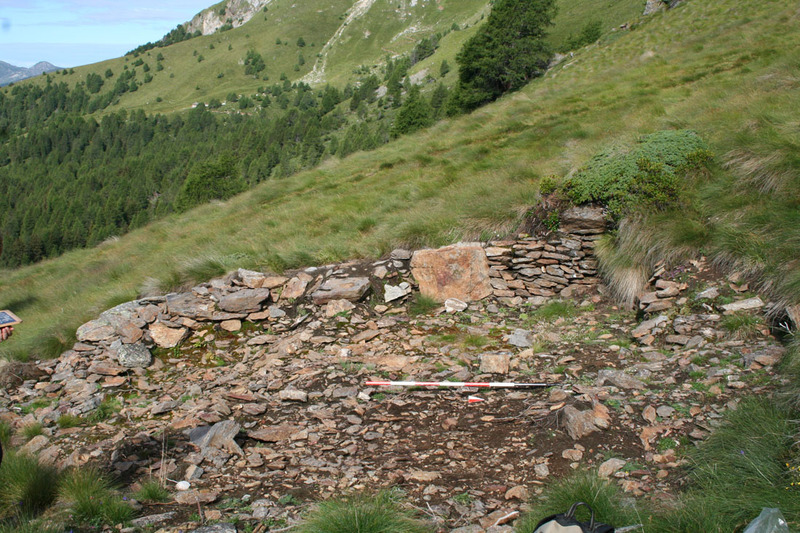 The walls were built into a cut made into the natural slope just downhill from Tower G: the construction technique is of good quality and resembles that of the northern wall of Structure E.
In the north wall there is a niche that one might interpret as a candle-holder: the remains of a candle were, in fact, found nearby. In the southwestern corner there is a large schistose stone laid flat, which makes one think of a doorstep. 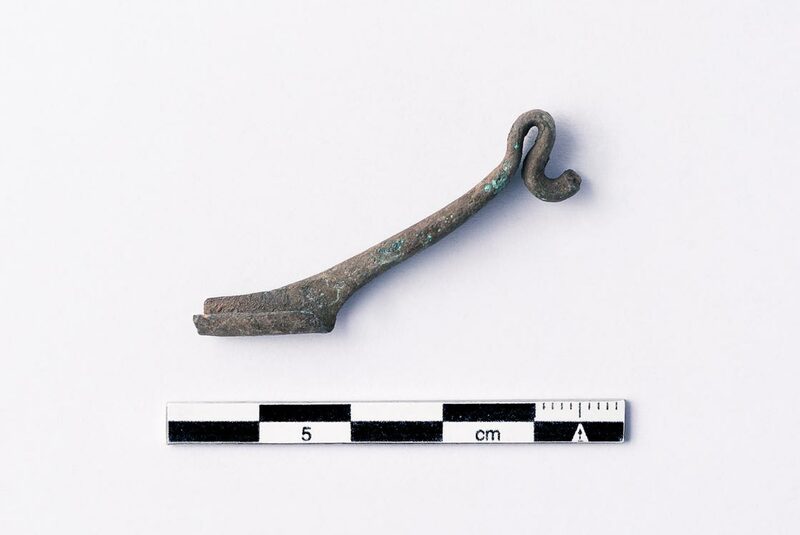 The living floor of area H yielded several important finds: an iron key for a piece of furniture (chest etc. 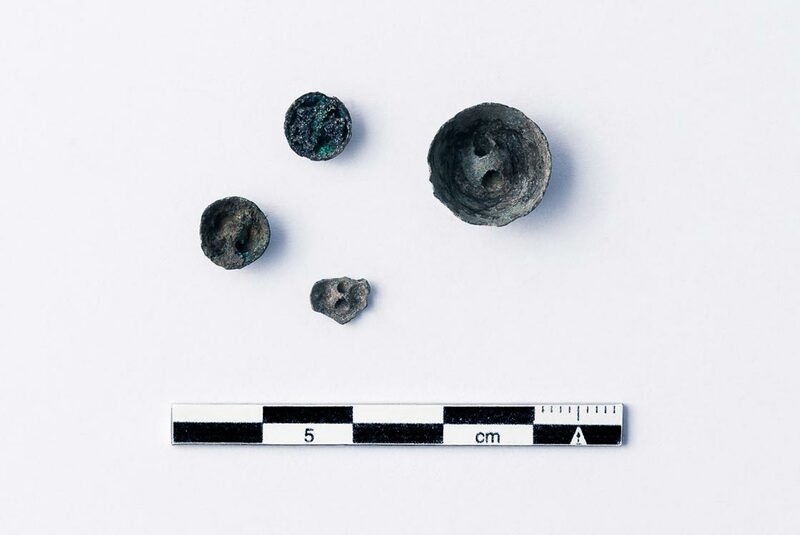 ), a coin from the Comune of Cremona (1254-1300), a bone die, two large stone beads along with a spherical one in silver alloy – these latter could be interpreted as buttons. 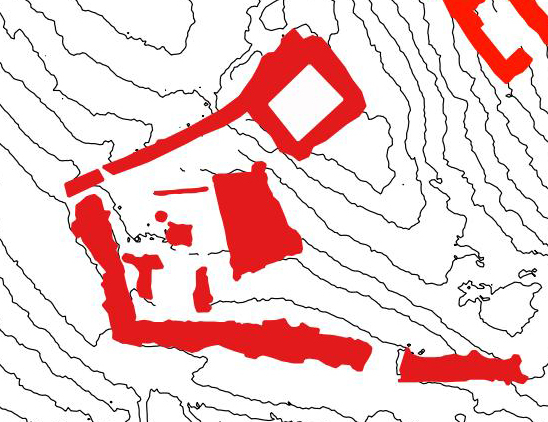 Area I is found just to the west of Area H. It has a rectangular plan, occupies a cut into the slope on the north side and sits on a rocky outcrop. 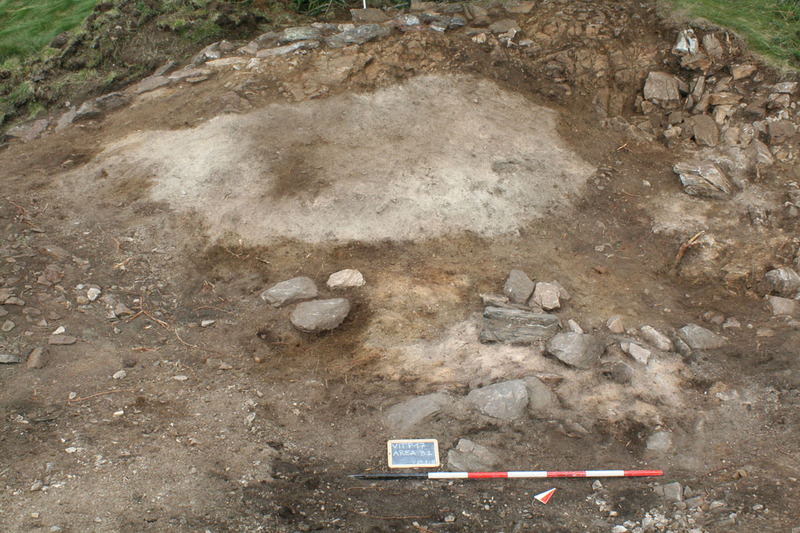 In the centre there is a large hearth made up of flat stones. 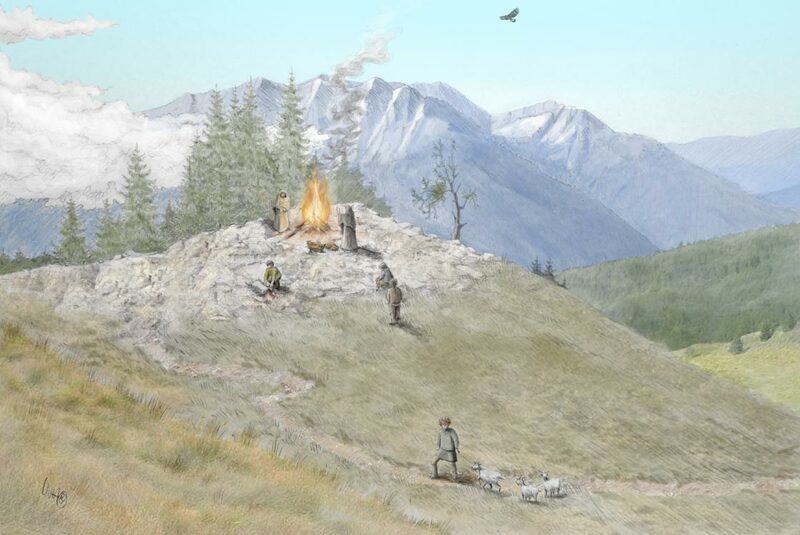 At the hearth, there is an area of earth that has been deeply scorched by the fire, while all around there is a thick carbonaceous layer that is rich with animal remains (from meals). 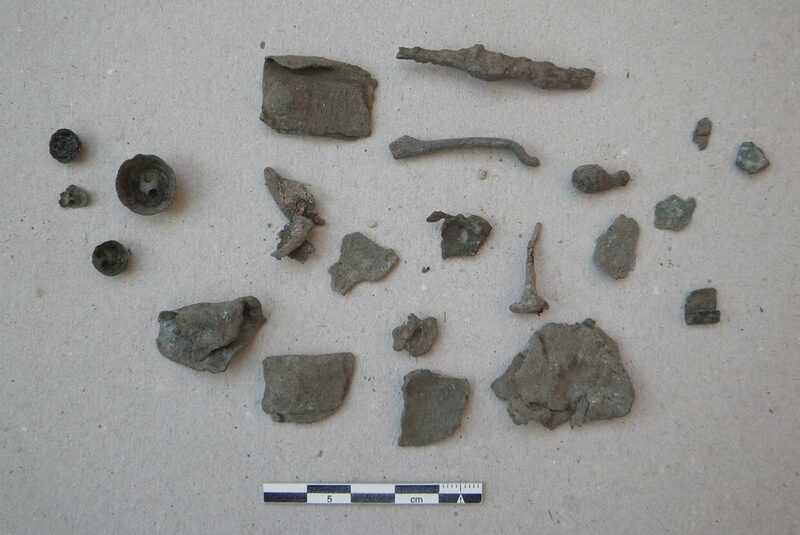 The layer also yielded a small piece of soapstone, small studs for a belt, fragments of a glass beaker and two coins: a low denomination coin issued by Raimondo della Torre, Patriarch of Aquileia (1277-1281) and a low denomination coin issued by the Comune of Padua (pre-1260 to 1318). 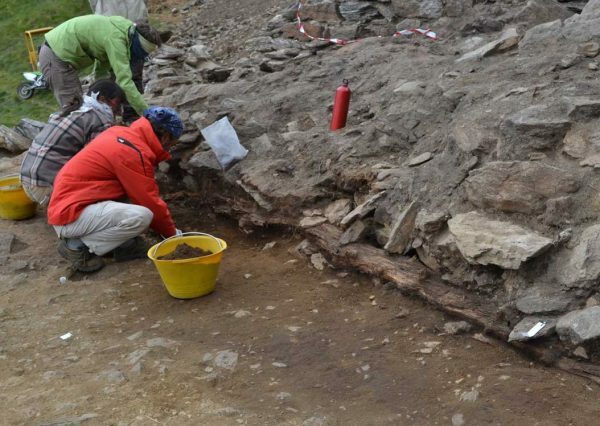 The only bounding feature identified is that along the north side: a wall of stones and wood that could be interpreted as a sort of revetment against the slope. 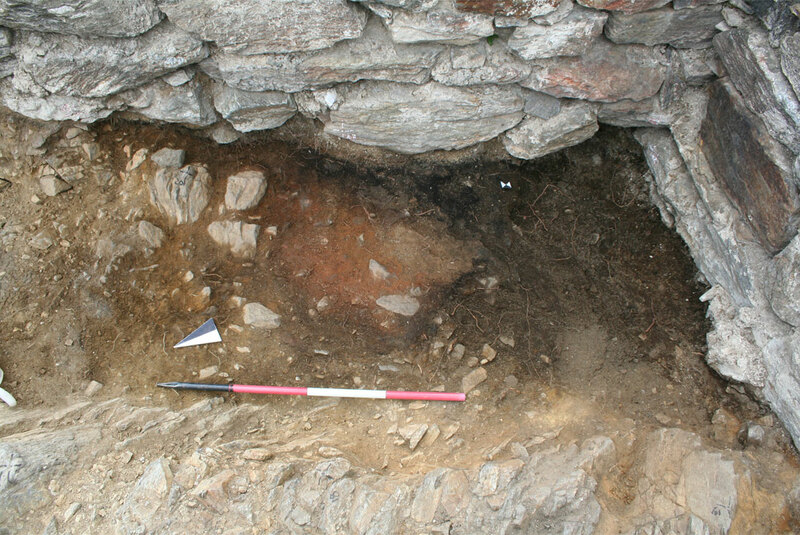 There is at least one post hole with stone lining near the hearth that suggests either the presence of a wooden roof or a structure to suspend cooking vessels over the fire. It thus seems reasonable to consider the area a courtyard. 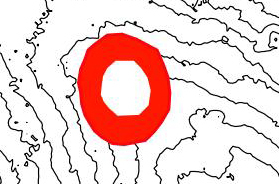 Room L is located immediately to the south of Area I. 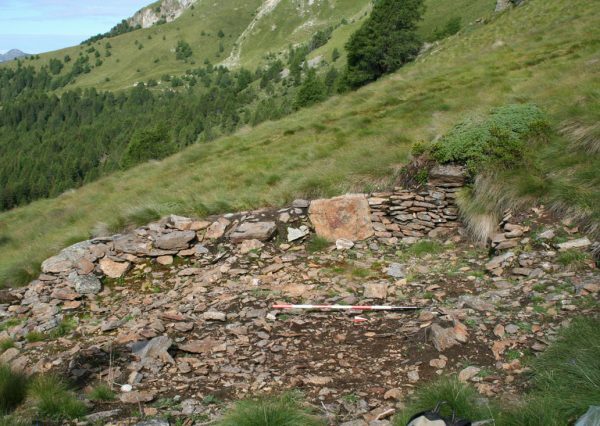 The perimeter wall survives in parts in the form of foundations but the rest has been lost to the collapse of Structure E and the effects of water running down the steep slope. Within the building, there is a fill of earth with a large organic component distributed across several strata mixed with stones. This allows us to interpret the room as a small stable – the presence of many horseshoe nails also supports this position. So the site is Late Medieval and not from the age of Charlemagne! However, the written sources tell us that this was a period in which Valcamonica was troubled by struggles between local lords seeking autonomy and foreign (or at least non-local) lords trying to control the territory both politically and economically. Perhaps new lords felt the need to have a temporary refuge or a means to demonstrate and assert their control over high altitude pastures – and so built the fortifications that we see today. 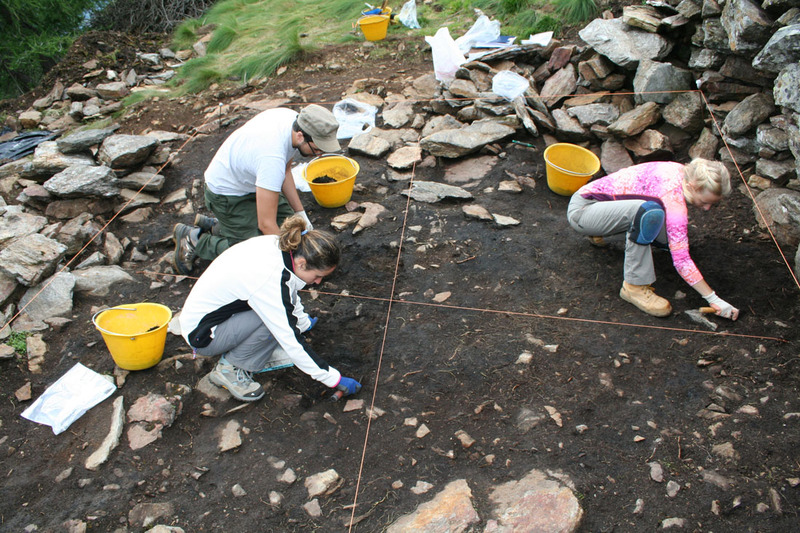 We hope to be able to better answer this question of “why” as research into the site and finds progresses. During the annual summer field season in 2015 an important discovery was made regarding the history of the high altitude (2250 m asl) site of Tor dei Pagà, situated below the summit of Mount Bles in the Comune of Vione. 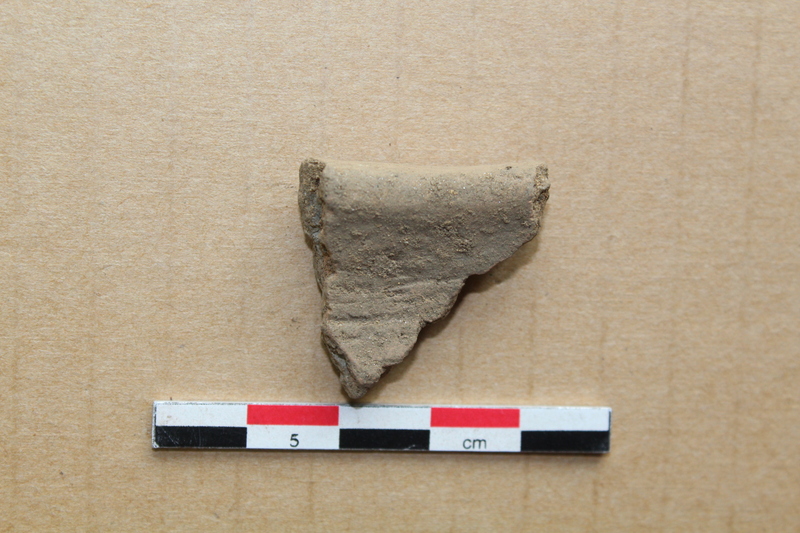 Below the late medieval (13th/14th century AD) walls and use floors of the site’s second tower (Tower B), we found traces of an earlier frequentation of the site. 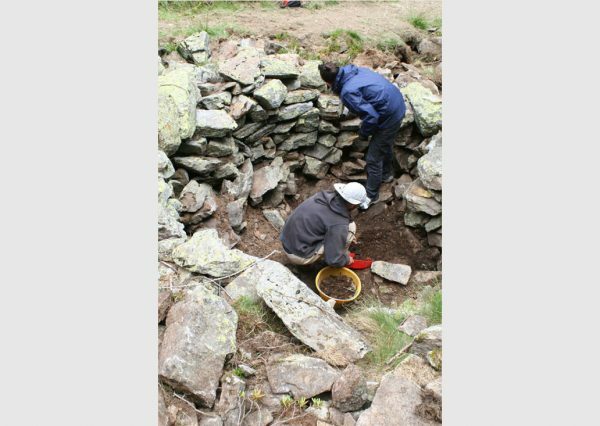 Specifically, a protohistoric use of the area, dated to between the 9th and 5th centuries BC on the basis of radiocarbon. 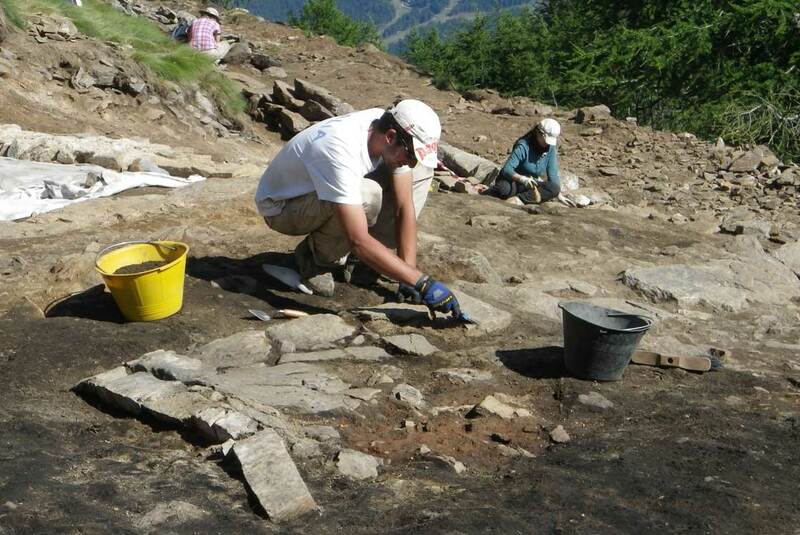 During that period, the site saw the repeated lighting of votive fires. 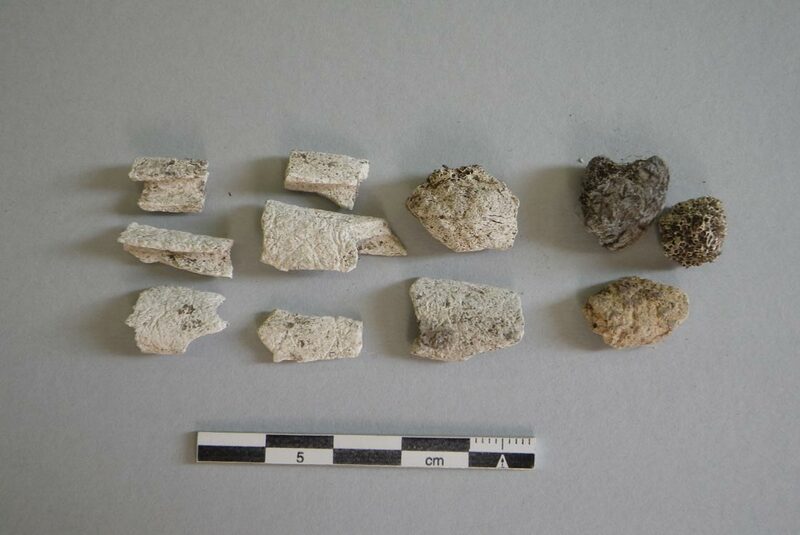 The carbonised layers along the rocky sides of Tower B contain the remains of various types of offerings and calcined bone. 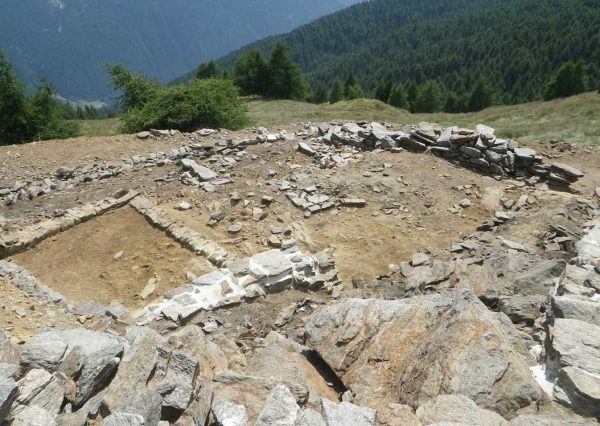 Such complexes are well known in archaeology thanks to numerous locations exhibiting similar practices in the nearby territories of Trentino and the South Tyrol. There, such sites are called by the German name “Brandopferplatz” (Burnt Offering Place). 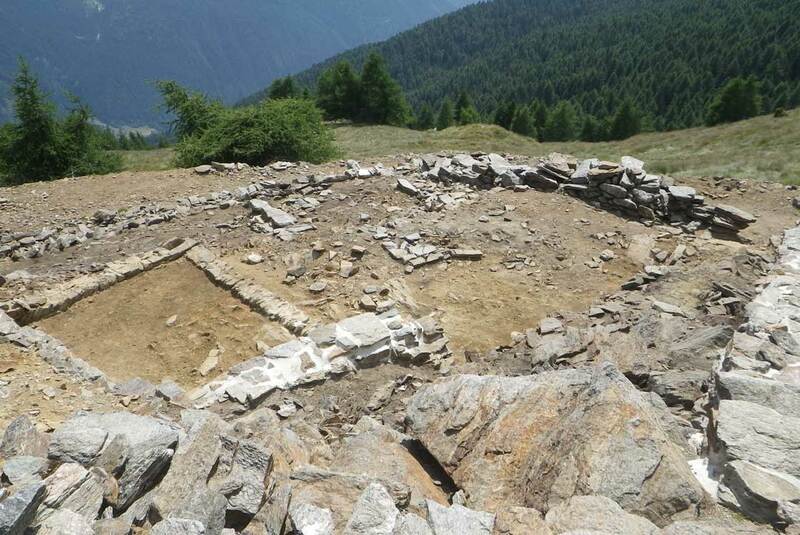 Sometimes Italian archaeologists call them “luoghi per roghi votivi” – places for votive fires. This cult practice is largely found from the Middle Bronze Age through to the La Tène Iron Age with various cases of survival into the late Roman period. 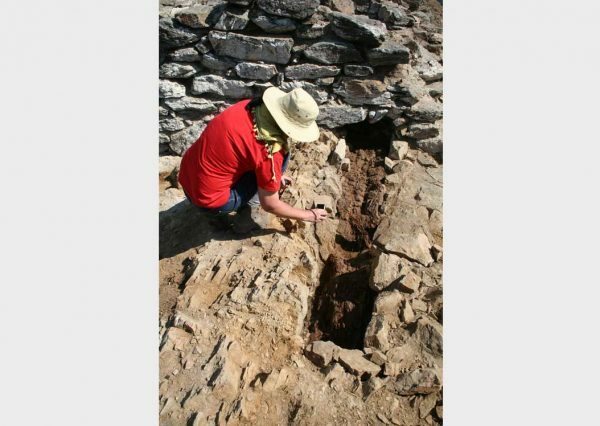 The sites tend to have certain common characteristics: closeness to a spring or place where water collects; dominant position, visible and recognisable from far away and the presence of structures such as boundary walls/fences, stone altars and processional pathways. A further common feature is the sacrifice of domestic animals (young goats, sheep, cattle and pigs), with whole portions of the animal being consumed by the flames, along with other food offerings such as handfuls of cereals or bread. 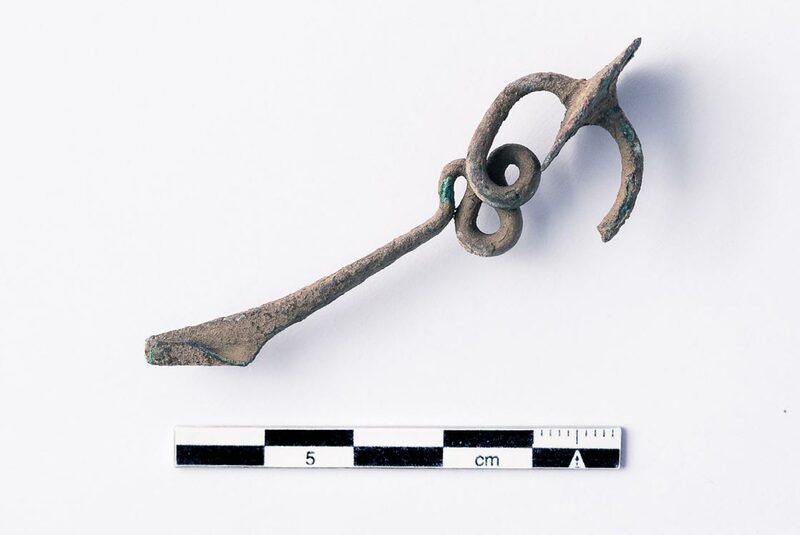 Other things were also offered to the flames: fibulae, pendants, bronze sheet ex-votos and, sometimes, weapons. 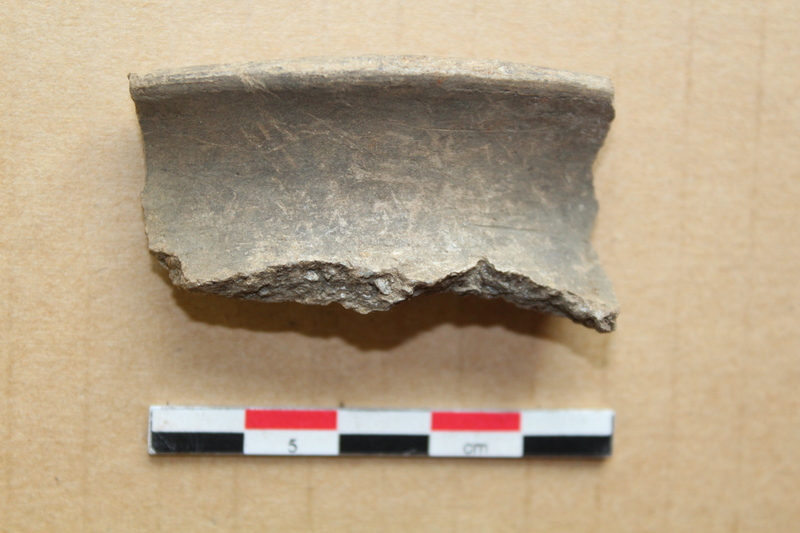 The pottery vessels used to make libations during the ceremonies would be ritually broken at the end of the ritual, either thrown into the fire or smashed on the ground. 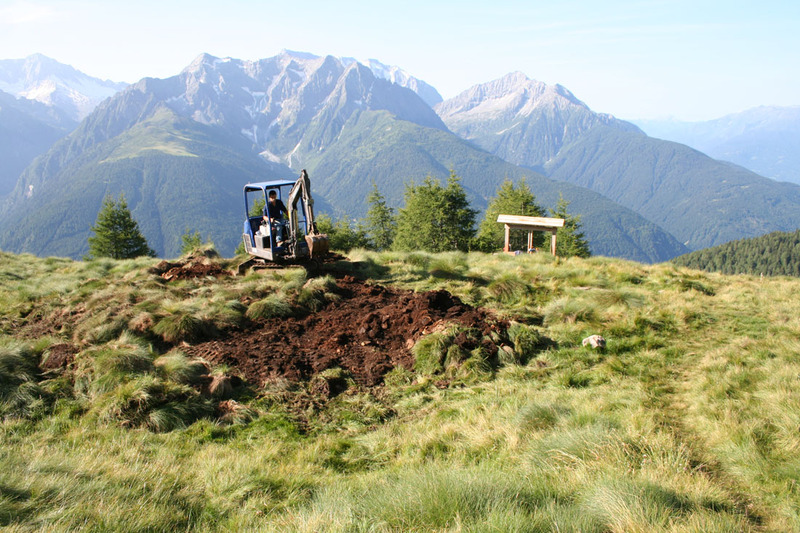 The area was then levelled before the next ceremony. 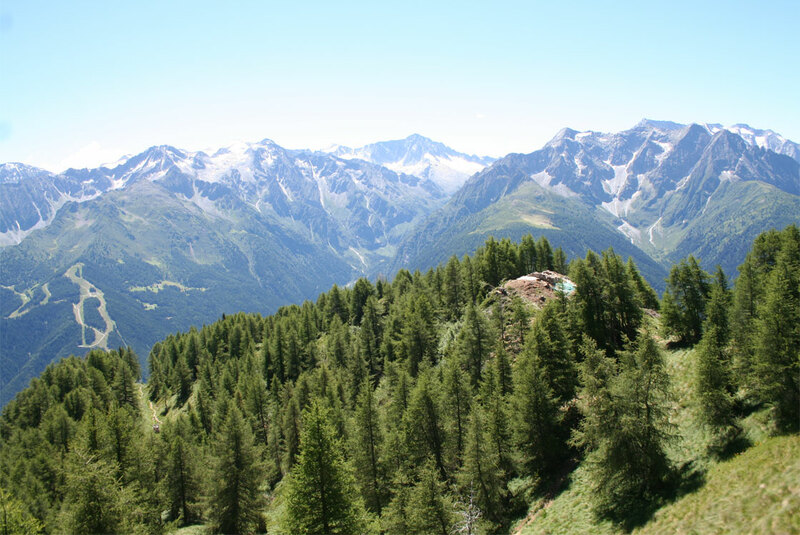 Numerous Alpine votive fire sites (Brandopferplätze), including that at the Tor dei Pagà, are united in being located in prominent high locations readily visible from the valley floor. 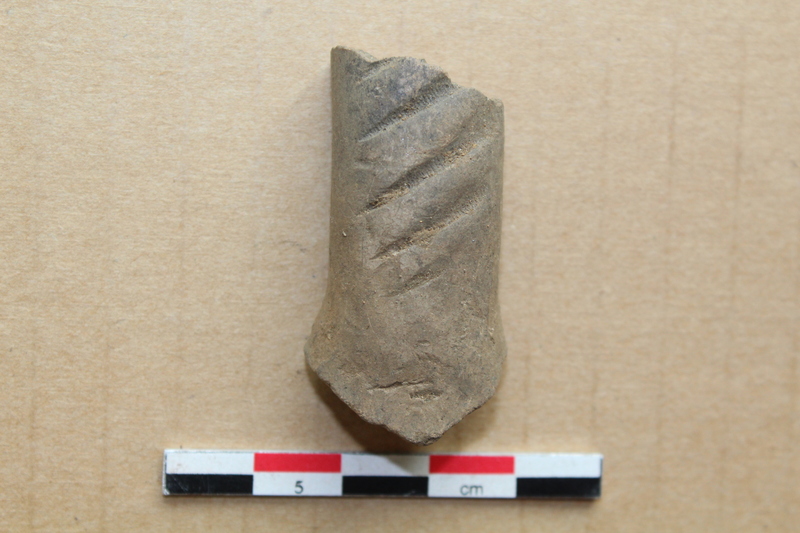 The fires would thus have been visible to people in the villages and also from other votive sites, constituting the framework of a “cult landscape”. 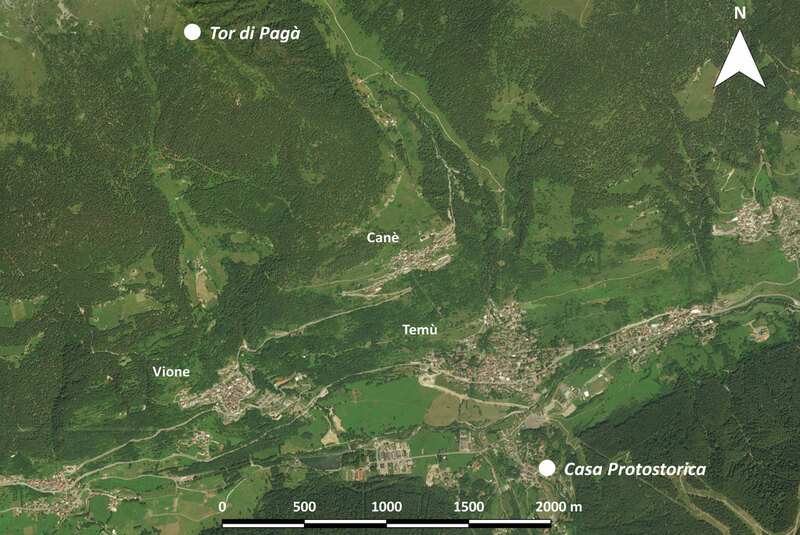 At this point it is very interesting to remember that there is an Iron Age house (late 6th to early 5th century BC) at the entry to the Val d’Avio in the Comune of Temù on the opposite side of the valley from Tor dei Pagà. This site was excavated by the Soprintendenza (2000-2001; 2005). 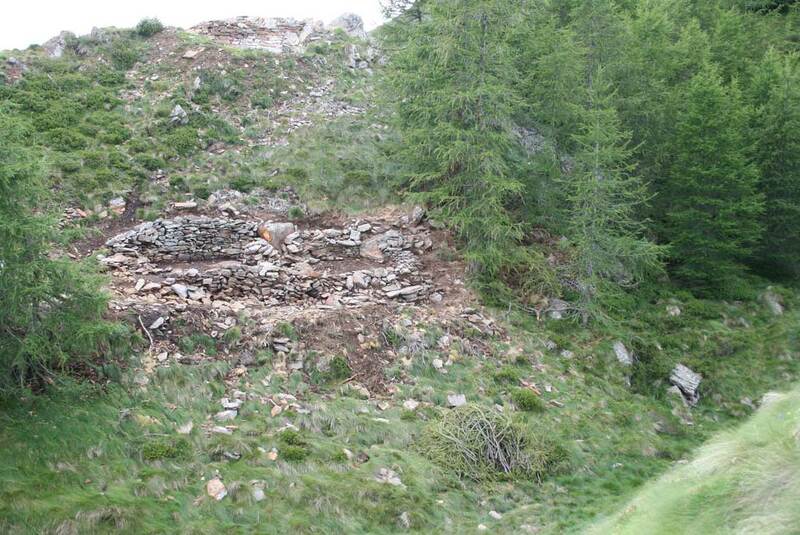 The materials recovered between 2015 and 2017 are currently being studied. 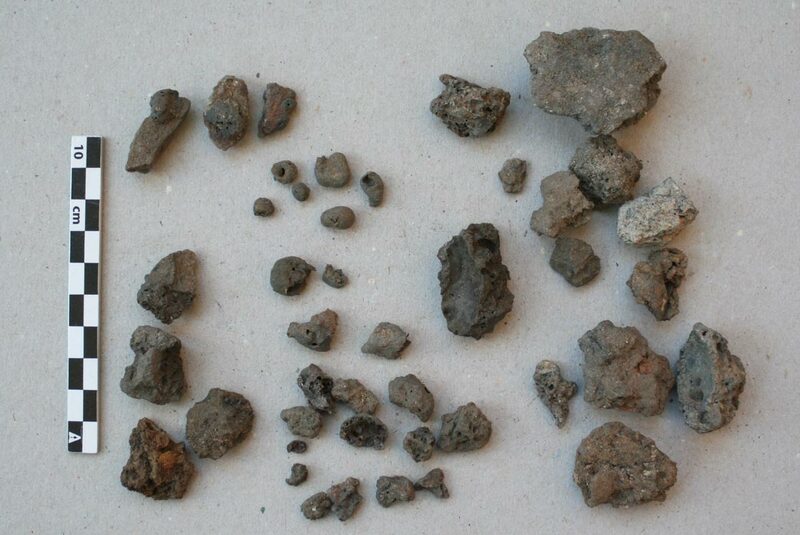 They are mainly metal objects (bronze), pottery and scarce and highly fragmented burnt bone. 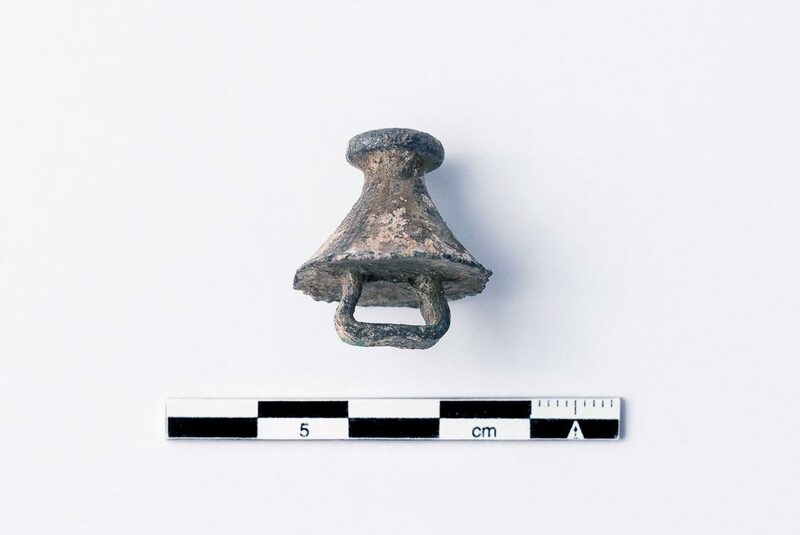 Amongst the most interesting of the bronze objects are fragments of fibulae, some of which have not been damaged by the fire such as a “serpentine arch (or just serpentine)” fibula with disc closure which is missing only the end of the bracket, along with others that suffered more from the flames. 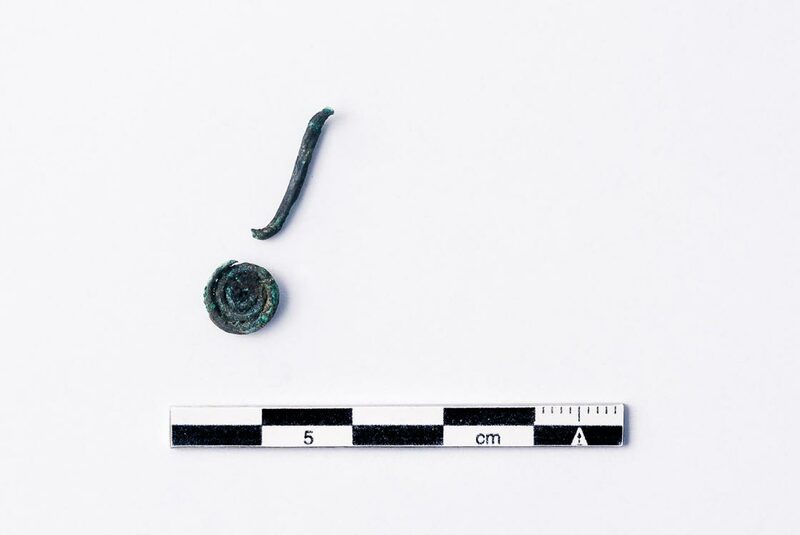 Other finds include two small spiral pendants and small semi-spherical “bullae” made from thin bronze sheet. 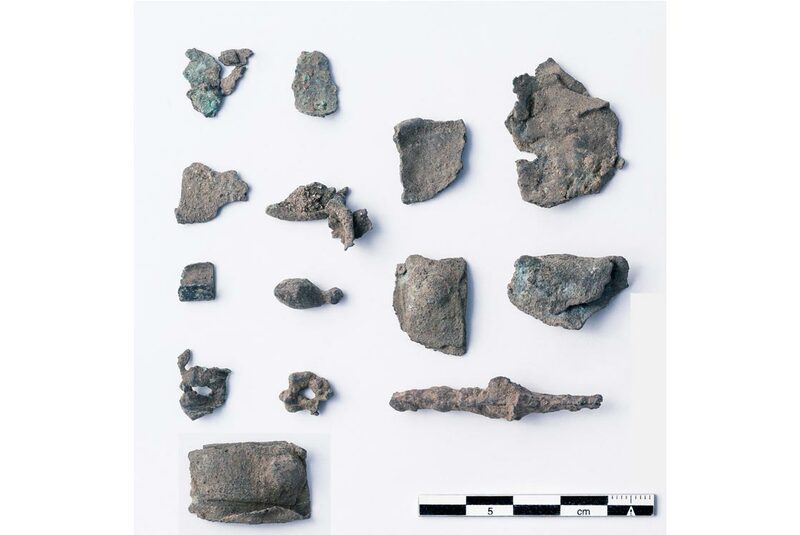 Finds also included items related to arms and armour such as a rare conical falera element (or perhaps a disc for a cuirass/armour for the upper body or shield) and numerous folded metal sheets that may be elements of a cuirass. 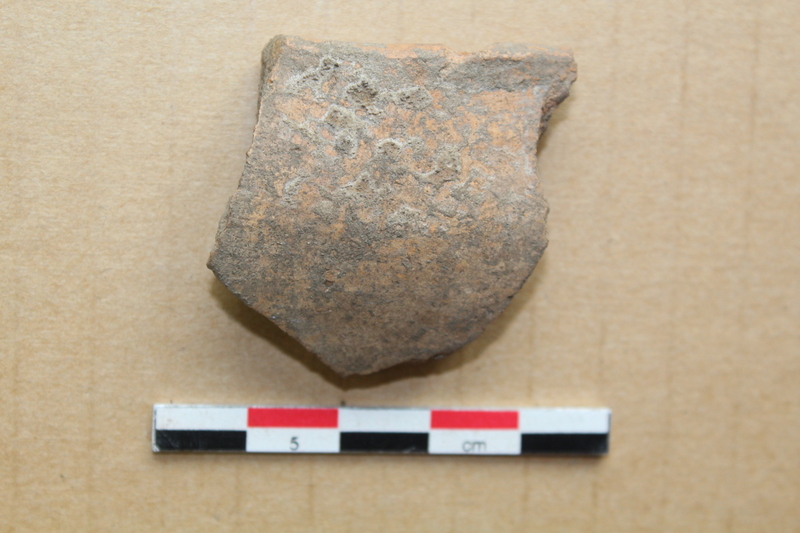 There are also numerous pottery fragments that have very smooth surfaces and, sometimes, decoration in the form of linear grooves or cord impressions made before firing. 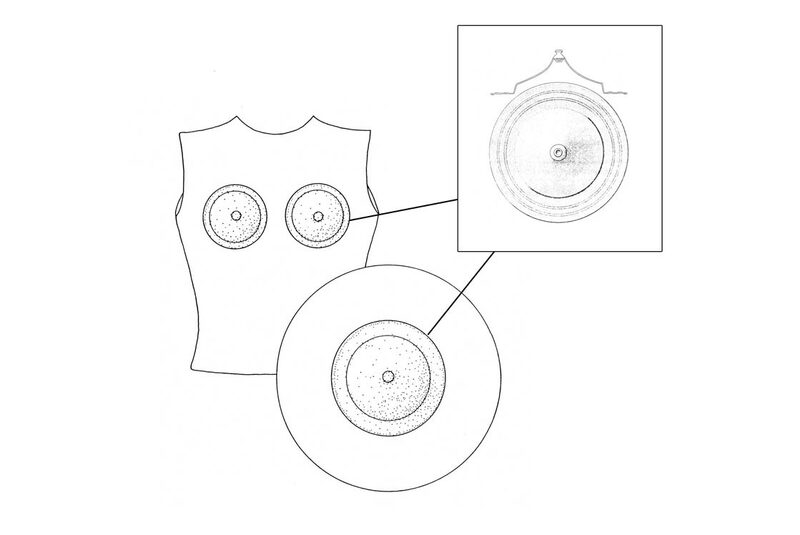 The types of vessel include large and small jugs for libations (with forms that recall those of the nearby Trentino area) along with cups and bowls. 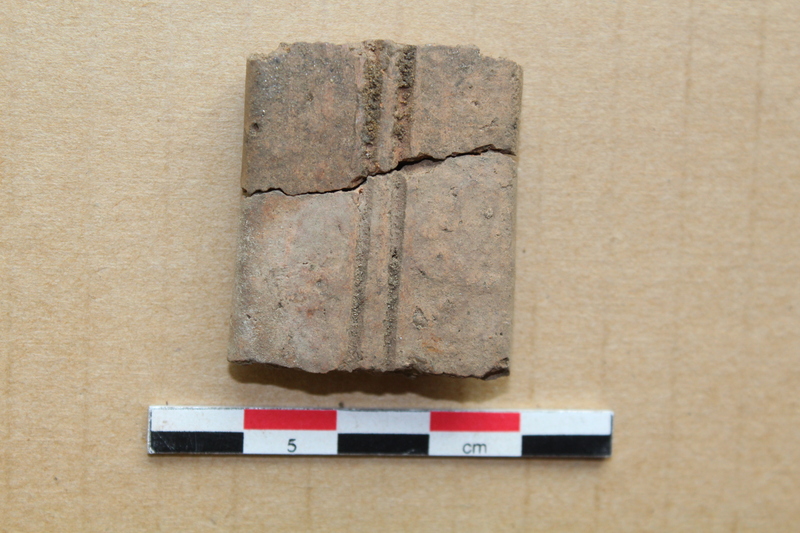 Amongst the most curious finds are numerous “scoriae”, perhaps the result of the melting of glass beads in the fire. 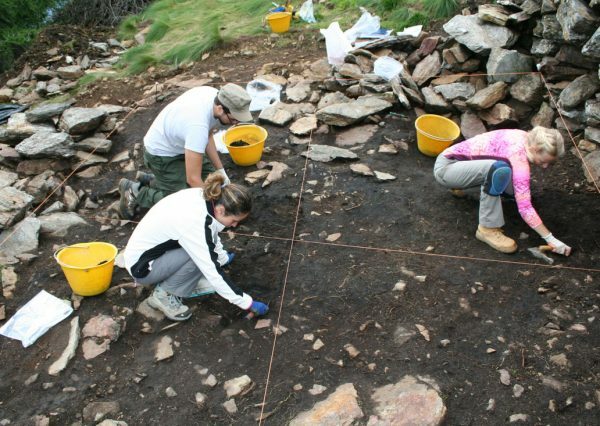 Only the full study of the materials found, along with restoration work, can give us the complete picture regarding the interpretation of the site and its precise chronology. 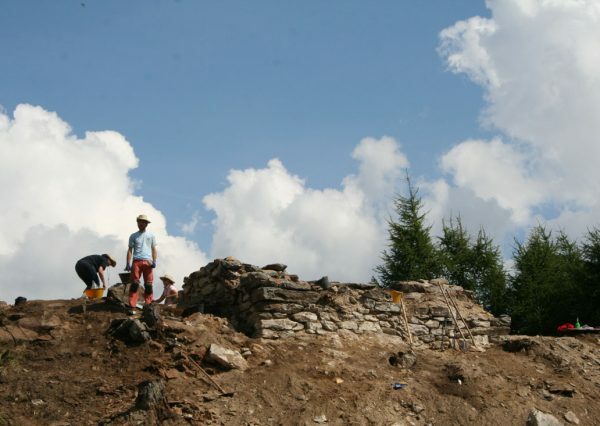 Work on the protohistoric phase of Tor dei Pagà was made possible thanks to funds from the region of Lombardy obtained by the Comune of Vione in 2017. 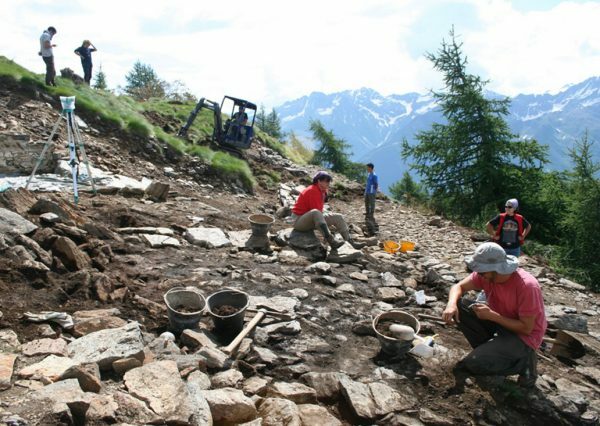 The work was directed by the Soprintendenza Archeologia Belle Arti e Paesaggio delle Province di Brescia e Bergamo (Giuseppina Ruggiero, Serena Solano) and carried out in the field by the following archaeologists: Nicola Degasperi, Michele Bassetti, Alessandro Potì, Nicola Pedergnana (CORA Società Archeologica S.r.l. Trento); Giovanna Bellandi, Riccardo Valente (Università Cattolica). We thank CAI Manerbio and especially Silvio Tomasi and Daniele Pedrotti for logistic support. Text by: Giovanna Bellandi, Nicola Degasperi, Michele Bassetti. Photography: Giovanna Bellandi, Giovanni Vanoglio, Nicola Degasperi, Michele Bassetti. Reconstruction drawing: Livia Stefan.